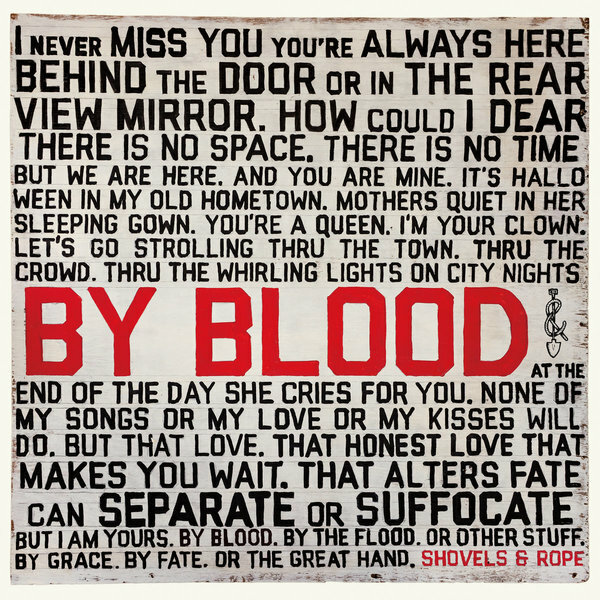 Early into the closing track of husband-and-wife duo Shovels & Rope‘s new album, By Blood, Michael Trent sings, “Never miss you, you’re always here / Behind the door, in the rearview mirror.” While the track, also the album’s title cut, is as much lullaby as it is love song, its underlying sentiment gets to the heart of what listeners love about the pair: their otherworldly connection to one another. Since releasing its self-titled debut album in 2008, the Charleston, S.C.-bred act has captivated fans with a no-frills take on punk-influenced roots music and joyful, revelatory live performances. While the pair’s sound has evolved considerably since then, the through-line has always been Trent and Cary Ann Hearst’s artistic intimacy, which finds them switching instruments mid-set (or mid-song, even), masterfully anticipating the other’s vocal harmonies and consistently drawing out the best in each other both in the studio and on the stage. Shovels & Rope’s 2016 album Little Seeds added greater nuance to the duo’s catalog, as much of that LP’s material, which also hinted at further forays into the fringier reaches of roots and rock, explored new parenthood. (The two welcomed a daughter in 2015, and just recently had their second child.) By Blood picks up where that album left off with an expansive meditation on family, community and what it means to live together — whether that’s under the same roof or on the same planet.